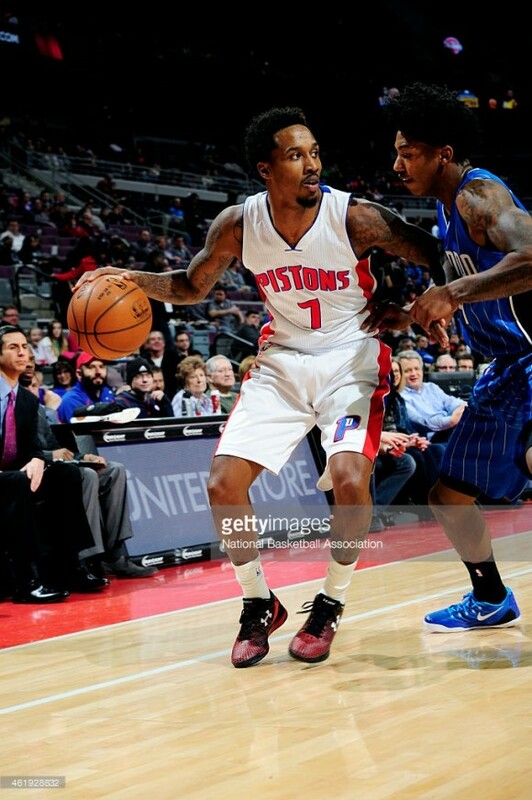 SneakerHistory is wishing Brandon Jennings a happy 26th birthday and a speedy recovery. It was reported today that a clean bill of health would not come for Jennings before the start of training camp. If you recall, Jennings suffered a catastrophic injury on January 24 in Milwaukee–a ruptured left Achilles. Fortunately, he’s running on the treadmill and shooting. Many know that Jennings was the star of the Pistons prior to his injury. He led the team on a 12-3 tear after dropping Josh Smith before Christmas. Channeling Allen Iverson, Jennings performed phenomenally in January before his injury. Check it out. You can also take a look at what the NBA deems his top 10 career plays, although the video is from two years ago. Jennings has worn mostly worn the Under Armour Clutchfit Drive Low as well as a range of UA offerings. Here’s hoping he recovers quickly and returns to the NBA to show people who’s boss. Jennings in the Under Armour Clutchfit Drive Low. Jennings in more Under Armour. Anyone Remember the Nike SB Dunk Low "Barf"?